In a style that is both engaging and accessible, the author deftly explores all aspects of historical research and writing, including, but not limited to, the history of history writing, identifying and obtaining source material, types of historical writing (research paper/historiographical essay), and a section on formatting footnotes and bibliographies.The result is a superb methodology that helps the novice, as well as advanced history student, understand the essential elements of research and writing, and the importance of creativity in interpreting and describing events of the past. What makes Going to the Sources stand out among the other instructional guides is its ability to simplify and clearly spell out a sequential step by step process to scholarly research and writing. Chapters 2-5 form the heart and soul of the book and offer sound advice on the fundamentals of writing history. Throughout the chapters, Brundage guides the reader through the elements of good historical craftsmanship - the use of historical sources (primary/secondary), selecting and refining a topic, note taking, outlines, quoting, and editing and revising. Especially useful is the historiographical essay sample found in Chapter 4. In many graduate courses, students are required to write historiographical essays; yet there are limited sources to help guide the student through this complex mode of historical writing. Although historiographical essays focus less on a particular research topic and more on interpretive themes of scholarly literature, Brundage feels, and rightly so, they are important enough to warrant coverage in this text. Although Going to the Sources offers a wealth of tips and advice on the fundamentals of research and writing, it lacks the detailed instruction that takes one beyond the basic research paper/essay. For example, book reviews and historiographical essays - requirements for most upper level graduate courses - demand critical thinking and analysis. Unfortunately, with the exception of a brief chapter on historiographical essays, Brundage chooses to focus less on the analytical process and more on the rudiments of writing. Readers interested in analytical writing techniques would be better served with other prominent works in the field, such as A Short Guide to Writing About History by Richard Marius and Melvin Page. This book offers solid instruction and writing samples on the different analytical approaches employed by historians. The main drawback notwithstanding, Going to the Sources is an eloquently written, hands-on research and writing manual. Brundage has done an outstanding job at presenting his topic in a fresh and compelling fashion. His unique ability to make sense of the often confusing world of historical research is commendable. Although the volume is a slim one, it is packed full of information on everything you need to know about the research and writing process. The couple of hours it will take to read this book will pay huge dividends in the end. 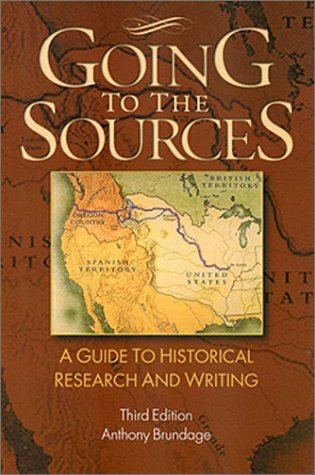 Going to the Sources: A Guide to Historical Research and Writing is a highly affordable, convenient tool for any student faced with the daunting task of writing a research paper. The chapter on how to use a library is worth the ten bucks all on its own.It is exactly the kind of overview of research materials and their use that librarians give when someone bothers to ask!Overall, the book is simple, straightforward, and USEFUL.Everything you need to know and nothing you don't when it comes to writing history papers.The couple of hours it will take you to read this book will pay off in the depth and quality of your paper, if you follow Brundage's research advice.This is THE book to buy if you have never written a research paper and have never been inside your campus library before.It is written for history majors, but there are only two chapters that other disciplines would want to skip.Most of the book is helpful to anyone who wants to learn something from their assignment -- not just get it done. 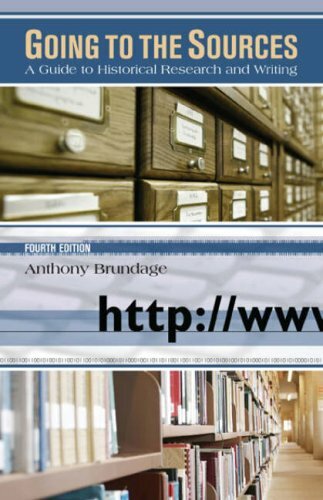 Anthony Brundage's book is a well-written, easy to understand introduction to the often confusing world of historical research. Though the volume is a slim one, he introduces the reader to all the basics, including thehistory of the study of history, the different types of historical sourcesand how and where to find them, the challenges of writing thehistoriographical essay, note taking, and writing an essay. This secondediton also features tips for using the World Wide Web as a source,something more and more people are doing these days.